Very soon after, a sentiment of resentment splashed with a bit of melancholy began to rise within me so I gathered them and took them when I left. The parking lot photo showed me standing gaunt and blank wearing woodland camouflage the afternoon I left Garden City for Camp Lejeune to prepare to go to Iraq. This was a picture of a young man who was anxious about war but too indoctrinated to acknowledge it. My photo was taken by the woman whom I had married months before, certain that we would grow old together. The day she took my photo she had worn indigo sweatpants, a canary yellow hooded sweatshirt and plain white Converses. Her hair only lightly grazed her shoulders. As I looked at myself in the photo, I began to remember that as the bus departed Garden City that evening, what she had been wearing that day would become my singular unaided recollection of her. From then, I would need a photograph to remind me of the contours of her face. I was puzzled why but time was too precious then to ponder such things. So I let the question slip, promising myself to ask again at another juncture. I had forgotten her facial features as soon as the bus started rolling. As much as I tried to recall her face, it was as if I had never stored it in the infinite expanse of my long-term memory. But this of course is not true. I recall her face with ease now and I would describe it as round, with high cheekbones and eyes brown and intensely intelligent. She was then and is now quite beautiful. But the evening I left, remembering such details became an exercise in both frustration and futility. As I began thinking about the answer to my question, I thought that it would be helpful to first define what memory is, so I consulted a text for an answer. According to “Psychology,” a textbook by Schacter, Gilbert and Wegner, “memories are the residue of [those] events, the enduring changes that experience makes in our brains and leaves behind when it passes.” According to the authors, “if an experience passes without leaving a trace, it might just as well not have happened.” In a sense, our memories define who we become. Let us say that the tablet is a gift of memory, the mother of the muses; and that when we wish to remember anything which we have seen, or heard, or thought in our own minds, we hold the wax to the perceptions and thoughts, and in the material receive the impressions of them as from the seal of a ring; and that we remember and know what is imprinted as long as the image lasts; but when the image is effaced, or cannot be taken, then we forget and do not know. It is obvious, then, that memory belongs to that part of the souls to which imagination belongs; all things which are imaginable are essentially objects of memory and those which necessarily involve imagination are objects of memory incidentally. The lasting state of which we call memory- as a kind of picture; for the stimulus produced impresses a sort of likeness of the percept, just as when men seal with signet rings. We must regard the mental picture within us as both an object of contemplation in itself and as a mental picture of something else. But we did have experiences that left behind traces that I could recall easily. The trip we took around lower Manhattan on the Circle Line. The day we were married. Us walking to the subway to take the No. 2 train the afternoon of the West Indian Day parade in 2002. These were all pleasant days that come to mind with out any retrieval cues and I believe that the idea of a pleasant day has much to do with why it was so difficult for me to remember her face that other day. State dependent retrieval is defined by Schacter, Gilbert and Wegner as the tendency for information to be better recalled when the person is in the same state during encoding and retrieval, or more simply when I tried to retrieve an image of her face from that day filled with uncertainty and angst, I found it hard to do so because for the most part, my most vivid memories of her face up until that point included some sort of cheerful experience. Certainly, that day my state of mind, and I suppose hers too, was not the same as the day we were married. Still eight years since, even as our relationship and marriage have collapsed, I find it hard to remember more than what she wore for my grand sendoff and maybe it is O.K. that that day an image of her face was not imprinted on my block of wax. 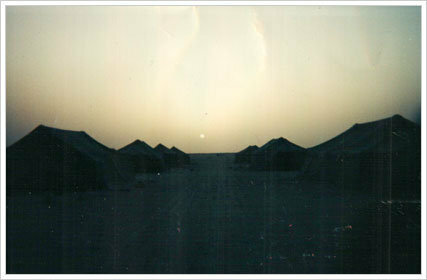 After the initial weeks of settling into Nasiriyah, the sergeants had devised a structure for the platoon’s day to day operations. One day of guard. One day spent patrolling. The third day spent as quick reaction force a k a, the rest day. 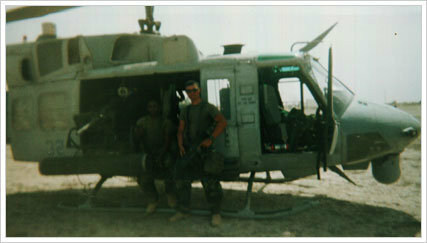 This cycle was repeated until the morning that we left Iraq for Kuwait. That morning, Frank Sinatra’s “New York, New York” streamed from our Humvees, moving us along like running cadence. That morning I smelled the smoke from our burn pit which rose from the desert like a date palm, for the final time and saw the men of the Italian carabinieri sitting in front of the compound without cover but not without cheerfulness. We waved to each other and I wondered how they would manage the monotony and defend against complacency. Routines have a way of creating the impression of security. But in Nasiriyah one had to be hypervigilant. One’s weapon had to remain serviced and accessible. One never left the compound without a helmet or an interceptor vest or an interpreter. One stayed on edge awaiting that rare skirmish. To relieve stress and pass time we would often pontificate about how different life would be once we returned home. For inspiration most of us relied on pictures of wives or girlfriends to ignite recollections or to stimulate dreaming. I taped the picture of her I’d fished from my cargo pocket in Garden City to the roof of my Kevlar and over the months my sweat and the sun’s rays quickened its fading. The morning that we left Nasiriyah, I shared this photo with an Italian who shared with me his talisman, a picture of his small daughter. He asked whether I had children and I said no, but we still joked about how in the future my son would marry his daughter. There was scuttlebutt about Britain’s Royal Marines habitually burning all traces of home before going into combat and I remember thinking how stoic of them, but I could never bring myself to do it. I correlated her fading image with my tenuous conception of home. I wanted to get home; therefore I wanted to get to her. The photo was my talisman. I sealed it inside a Ziploc bag to stave off continued deterioration and there it stayed until I lost it. In October I saw on the news that a suicide bombing had occurred in Nasiriyah, not far from where we had been relieved by the Italians, and that the bombing had killed more than a dozen of them. Maybe the Brits had it right all along. What good is sentimentality in the face of circumstance? I had not learned that Italian’s name but that night I got on my knees and prayed for all of them and for him and his family. I haven’t spoken with God in a while but I truly hope that he heard that prayer. The author and Oum, a fellow Marine, in Iraq, 2003. The problem with writing from memory is the problem of truth. There is a concern when writing nonfiction, autobiography, memoir etc…about truth and relating truth to one’s readers. Truth, of course, is paramount. The reader expects it and it is the writer’s obligation to remain truthful to experience and memory but this notion of truth is not truth with a capital T. It can never be. In fact, the notion of what is true will be colored by the author’s experience, perception of that experience, his biases and his own fading memories. Stories regardless of genre should be read with these parameters in mind. A piece of nonfiction can never be truly devoid of untruths. What is important is the author’s intention to relate the facts as he truthfully recalls them and the readers’ acceptance of the limitation imposed by nonfiction. Because our memories define who we become, when writing from memory subjectivity though not ideal will color the writing. How one perceives the self will undoubtedly inform how introspective a piece of writing culled from traces of experiences will be. Several days ago we sat at a diner to talk a few things over and she looked at me squarely and asked, “Did we not have good times?” As I spread jam on my toast, I thought back to the day we took the Circle Line, how at ease she had looked. I thought to myself, “Yes, sometimes.” When the bill came she insisted on paying her share, then we went our own ways. The next day, I bent to scrub soap scum from my bathtub, half kneeling, half praying. I wanted to inter the unshaven face I regarded in the mirror. I turned the tap and water splattered about the sink and a few drops splashed haphazardly into the cup I was holding. Off. Water from the cup rinsing the loosened soap scum was an earsplitting contrast to life’s insufferable silence. If I succumb to the stillness, I thought… but there is not a soul to talk to in the house except, me. It was late and the day had slipped unhurriedly by. I walked back into my bedroom and looked down at the chaos of papers and photos strewn across my bed and decided it was time to put it all away. 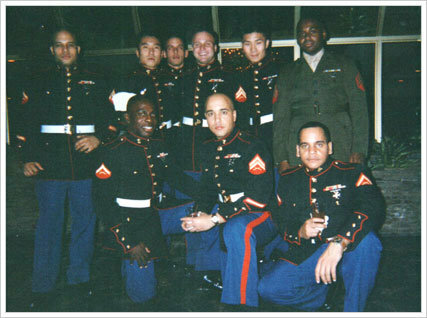 Maurice Decaul served in the Marine Corps for nearly five years. 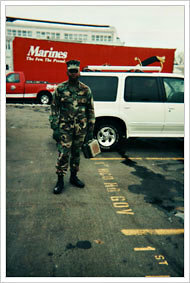 He deployed to Nasiriyah, Iraq, in 2003 as a squad leader with Weapons Company, 2nd Battalion, 25th Marine Regiment. He lives in Brooklyn and is studying at Columbia University.